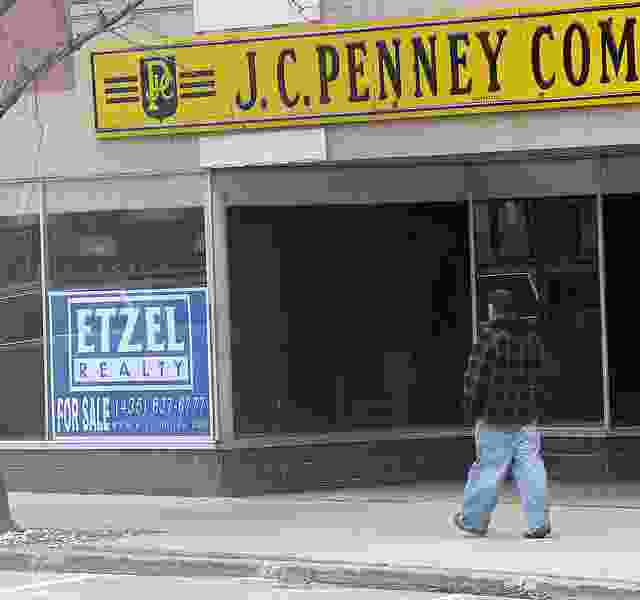 (Al Hartmann | Tribune file photo) A for sale sign is seen in the old J.C. Penny store on Price's Main Street in this 2016 photo. The town, along with many others in rural Utah, have struggled with job losses and in a changing economy. Last year, Rep. Carl Albrecht, R-Richfield, sponsored and passed a bill aimed at boosting the number of jobs in rural Utah by offering state grants of up to $25,000 apiece to companies hiring new employees. Now, just seven months after HB390 took effect, he wants to increase the incentive cap tenfold, to $250,000. Soon after HB390 kicked in, Albrecht says, an employer approached him, saying he wanted to hire more than 30 workers in rural Utah. But the way the law was structured, he’d only be eligible to receive enough grant money to cover the hiring of four workers, at $6,000 apiece. Ultimately, he decided it was too much of a hassle and decided to skip applying for the program. “I don’t know about you folks on the Wasatch Front, but 30 jobs in rural Utah is a very big deal. A very big deal,” Albrecht said. Under HB110 jobs grants are available only for employers hiring workers in the state’s small counties, with populations of up to 31,000. That means companies hiring in 17 of the state’s 29 counties would qualify, from Sanpete, with a population just over 30,000, to tiny Daggett, with around 1,000 residents. The bill, passed 68-0 by Utah House on Friday and headed to the Senate, doesn’t change the cost of the program created last year: an ongoing annual appropriation of $728,000. Albrecht said companies and lawmakers from larger counties like Salt Lake need to look beyond the Wasatch Front. Ginger Chinn, state managing director of rural and urban business services, helped explain HB110 to members of the House Economic Development and Workforce Services Committee earlier in the week. Companies can receive one incentive per rural employee hired. At the conclusion of one year, the employer won’t be able to apply again for the same employee, but if the company hires a new person to fill a different job, it can receive the incentive again, she said. Chinn said the effort to bring jobs to rural Utah hasn’t been as successful as it could be, but she thinks HB110 could work, pulling jobs into rural Utah. The addition of one job along the Wasatch Front isn’t a big deal but translates to about 25 jobs in rural areas. Rep. Timothy D. Hawkes, R-Centerville, said his biggest concern with Albrecht’s bill was similar to his concern with all economic incentives — does it run this risk of incentivizing something that would have happened on its own? Rep. Derrin Owens, vice chairman of the economic development committee, said he likes the fact that the bill’s incentives are given after the company proves itself. While it isn’t the long-term solution to job creation, it could provide enough of an incentive to get companies to become established in small communities where economies are struggling. Not everyone feels as positively about increasing economic incentives. In an interview, Heather Williamson, director of Utah’s chapter of Americans for Prosperity, said her organization opposes the bill. Government shouldn’t be in the business of handling out taxpayer dollars to select companies, she reasoned. Corporate welfare disguised as economic development does not work and rather than handing out sums of cash, the government should “create a level playing field and foster growth for all businesses,” she said.